Condo for rent in Jomtien Thailand.View Talay 2-5 rents Jomtien Thailand Terms and conditions - Rent my condo jomtien. Below are my terms and conditions and deposit payment information. Please read them. There is no small print just plane English. This page is very important, it tells you how to make your deposit payment and the terms and condition of the payment. Please read carefully. To book and reserve a condo all our guests need to make a deposit/booking payment. This payment guarantees that the condo shall be held for you until your arrival date. Once your deposit is received I will send you a confirmation E-mail with the dates you have booked to stay. Please note that a condo will not be reserved for anyone who has not paid a deposit / booking fee. Before I ask for a deposit/booking payment I shall confirm by email that the Condo and room number of condo is free on your dates. How to pay the deposit. Use PayPal. Its safe and secure. Once the guest has confirmed that they wish to book a condo I shall send a PayPal invoice to the their email address. PayPal is easy. No need to have a PayPal account you can make your deposit /booking payment using credit card. All major credit cards are accepted. Please be aware there is a 5.5% surcharge when using PayPal. This what PayPal charge me for sending an invoice. Here is an example: Deposit 10,000 Baht. plus PayPal surcharge of 5.5% Total payment due is 10,500 Baht. NO SMALL PRINT! THIS EVERY GUEST NEEDS TO READ BEFORE MAKING A PAYMENT. I give a guarantee that once a guest has made their deposit/booking payment I will reserve the condo even if I get a better or longer term offer. 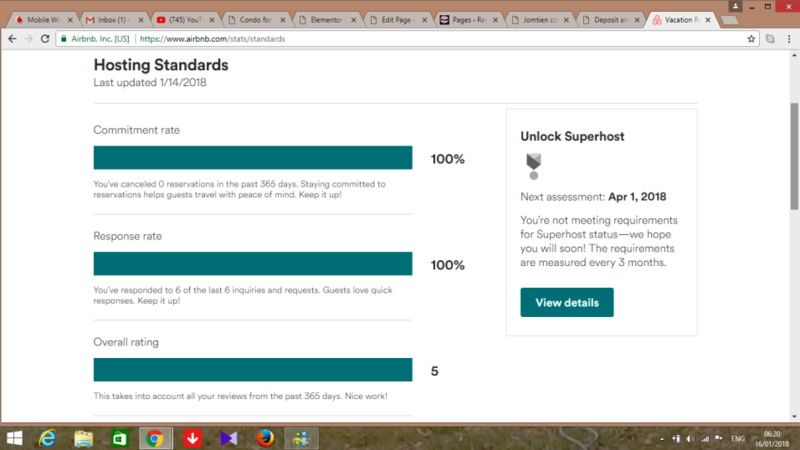 Please see a screen shot of my AIRBNB page showing my commitment to bookings received. Important Note: I give the guarantee of reserving the condo. Should the guest cancel their booking for what ever reason then the deposit shall not be refunded. Why so strict? Becauce I have accepted your booking I would have turned away other potential guests. If however I cannot rent the property for what ever reason (Unless death) fulfill my agreement to rent the agreed property or provide a suitable equivalent then the deposit well be refunded in full plus 25%. Please: Before traveling make sure you have adequate travel and medical insurance. Please do not travel to Thailand with out adequate insurance. Should a guest suffer any loss or accident while staying in one of my condos I will not be responsible. It is the guests responsibility that they have travel and medical insurance to cover all if any loss or damage to their person or belongings. Upon arrival I ask all my guests to sign a rental agreement. I also ask that they sign a pictorial inventory showing how the condo looked on the day of their arrival. If possible please bring a copy of your passport. Blow are examples of the contract and Pictorial inventory.